Power Plus Piranha Dynamo Shaver Review. Ever run out of power and all you had left was to shave your chin or maybe your mustache? I have. It is a bummer. So out comes the old standby straight razor that my dad handed down to me to finish my shaving. Unless I am on the road and in a motel. Than I have to go down to the lobby and get a razor and can of shaving cream out of the vending machine. Well this shaver can remedy all of that. It is powered by recharging with a regular charger, the same as you probably do already. But, and here is the good part, you can also wind up the shaver and power it that way. No electrical outlets, no waiting for a full charge, just wind and shave. 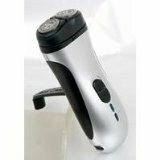 Give it shot, this is a unique and handy shaver at a great price.